Complete daily Vitamin-Mineral supplement for dogs, puppies & toy breeds. Pet Tabs are great tasting and chewable. Liver based for a high-quality source of protein for better health and more energy. 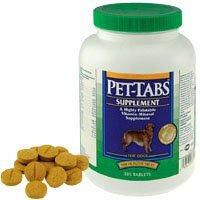 Pups & dogs less than 10 Lbs -1/2 tab daily; over 10 Lbs -1 tab daily. Ingredients Continued: dl-Alpha Tocopheryl Acetate, Vitamin A Acetate, Zinc Oxide, Riboflavin, Thiamine Mononitrate, Pyridoxine Hydrochloride, Cyanocobalamin, Manganese Sulfate, Copper Acetate Monohydrate, Vitamin D3, Cobalt Sulfate. Good Price on a Good Product! We've used these tabs 20 Yrs.